PDF 1: Eight unique 2-Panel Journal Image Pages to create 16 stunning vintage page designs when folded. Create one journal or mini album with all 16 distinct images, or break them down into smaller projects or even eight one-signature booklets. PDF 2: Two 2-Panel Floral Lined Pages, each with a blue floral arrangement and butterflies. One vintage solid lined page is included to print on the back of them, if desired, which measures slightly larger to avoid white edges. PDF 3: The “Minuet” Double Pocket w/ two 2-Panel Tags is a perfect addition to the “Feathers and Friends” Printable Journal Kit. The double pocket prints as one piece and folds together, creating a top-loading and shorter front pocket, measuring approximately 3-1/8” x 5”. Two 2-panel tags also are included in the set. The taller tag fits into the top-loading pocket and measures about 2-7/8” x 5-1/2” folded. The shorter tag measures about 2-7/8” x 4” finished. Glue the two panels closed to create front-and-back tags or simply fold to create journaling tags. Embellish as desired. PDF 4: The Feathers and Friends 2-Panel Tags with Pocket Sleeves (4 in the set) match the featured designer pages in the Feathers and Friends Printable Journal Kit. Each finished tag measures approximately 2-3/4” x 4-3/8” (folded). The finished sleeves measure approximately 2-7/8” x 4-3/8”. Glue the panels together for back-and-front journal tags, or simply fold them to use as booklets. Embellish as desired. Note: This kit is formatted to print landscape orientation at 100 percent on 11” x 8.5” paper and card stock. Colors may vary from one printer to the next and depending on the quality of paper used. This kit printed out beautiful. I made a beautiful little booklet with this. 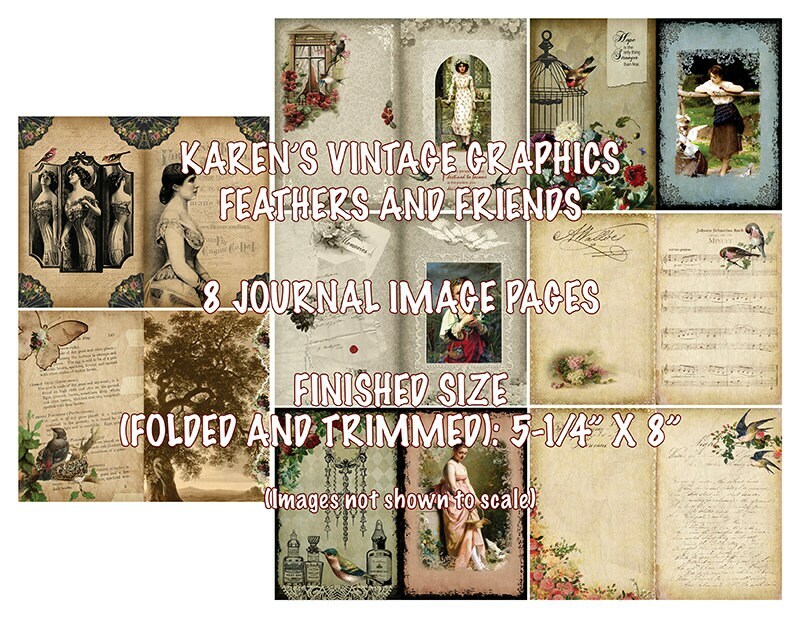 With your purchase and subsequent download of Karen’s Vintage Graphics designs, you may create your own tangible handmade goods for personal use for yourself and for gifting. At no additional charge, you may sell up to 20 personally handmade finished journals or booklets, using either the Original Vintage Journal printable kit; Library Card Booklet; To-Do List Card Booklet; or Coffee/Tea Loyalty Card Booklet. Please contact me if you hope to sell more than 20 up to 100. Copyright for these digital downloads are not part of your purchase, whether for personal use or for selling. Mass-producing is not permitted. Digital downloaded files, whether in part or whole, may not be shared, duplicated, resold, posted online, mass-printed or incorporated into other graphic designs or products. Due to the nature of Karen’s Vintage Graphics digital downloads, once a purchase is made and downloaded, the files are irretrievable. All sales, therefore, are final and non-refundable. Please feel free to leave me a message if you have questions.